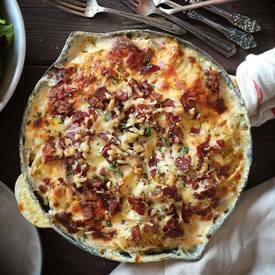 Bacon & gruyere scalloped potatoes! Potatoes smothered in butter, cheese and cream with a full pound of BACON ... this recipe is not for the faint of heart! But, if you are looking for a creamy, decedent and comforting side dish to impress your guests, this one is for you! !